We've had quite a ride these past 33 years. It has only taken me 3 decades to realize your potential. So today, I thank you for getting me to this point. We've weathered numerous storms over the years. Many self-inflicted, some by forces of nature. I've watched you transform through childhood, the teenage years, and into this ridiculousness known as adulthood. We've taken a lot of beatings. Broken bones, bruises, sprains, strains, cuts, abrasions, and sunburns. When we were 7, we were pretending to be in the Tour de France finish chute full of celebration on our bicycle. 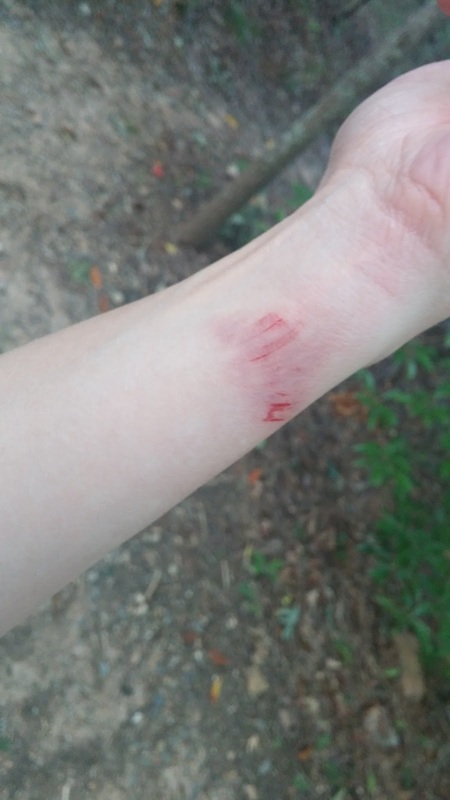 After landing face first on the pavement and learning the pain of rubbing alcohol to open skin, we quickly learned battle scars are easily won if attempting to go hands-free. We've ravaged the flu, colds, strep throat, food poisoning, and anaphylactic shock. The bee that wrangled its way into our truck at 17 was unavoidable. I'm just glad you were able to tough out the few minutes it took for us to get back to our dorm room and retrieve the Epi-Pen. I'll admit I felt a little badass plunging that needle into our thigh to keep breathing. We've managed to bounce back from a lot of really bad choices in life. We've hit rock bottom at 81 pounds. We've known the intricacies of operating a bong. We've lost a few hours of life to Jack Daniels. I cannot be thankful enough that you stood by me until we finally discovered that hurting you wasn't a way to live. We've taken a lot of stabs at a lot of sports. Softball, t-ball, ballet, tap, swimming, basketball, volleyball, tennis, and running. We racked up a lot of green ribbons in swimming. Someone has to come in 6th place. And we could run the court in the basketball like nobody's business. We just didn't really develop enough hand-eye coordination to get the ball into the basket. Thankfully, we found running. Which brings me to the present tense. You have shown me that you are stronger and more beautiful than I've thought. Despite the current batch of poison ivy that has sprouted under your lower lip, the flaking scabs across your left leg, and missing toenail with accompanying blister on your right foot, you are truly stunning. I have asked more of you this year than ever before and you've done nothing but support me through every step. And today, I celebrate how much I appreciate every perfect imperfection. Because someday I will not be able to do what I can do today. And what I can do today gets bigger and better as each day passes. Those 25 mile weeks have inched to 45 mile weeks. Those treadmill sessions to avoid the heat have been replaced by long runs in 90°. 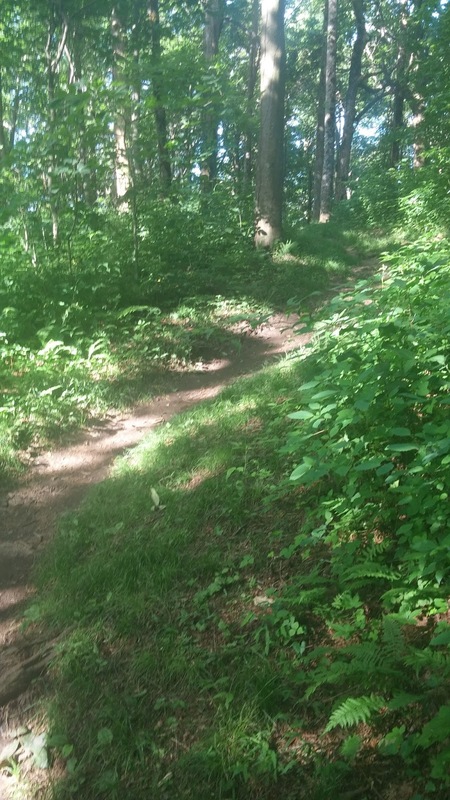 Those flat Greenway runs have been sprinkled with single-track switchbacks full of roots. The goal is no longer just to finish, but to compete. I love how your muscular legs power up the hills without a complaint. I love how your lungs and heart work as a team to give me the air and blood required to get faster. I love how your feet endure 40 hours of standing on concrete floors each week and another 7 hours of running without pain. I love how your biceps allow you to lift furniture with relative ease. I love how your stomach can endure a plate of nachos and a pint of beer as the precursor to 20 miles in the morning. I love that you have taut areas rippling with muscles and yet, a softness that says I love running, but I also love Oreos. It's so easy to get mad at you body. You aren't one of a world-class athlete or a supermodel. You don't have defined abs and your skin is ridiculously sensitive. But don't compare yourself. You are amazing because of what you can do. Being the best version of you is all that we need in this life. So let's be proud of all the fantastic things we do together every day. There is a wanderlust spirit hovering inside me. The organized, rational, and methodical person overrides her grandiose ideas. And I like air conditioning a lot. 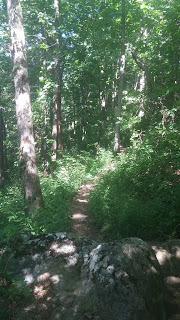 But sometimes I feel that bubbling spirit when careening through woods and I can't help but feel attune to moment. Creature comforts seem to be an easy trade when the world is dripping with green and humans are sparse. I'm falling a bit harder and faster for trails these days. It's really a perfect storm. 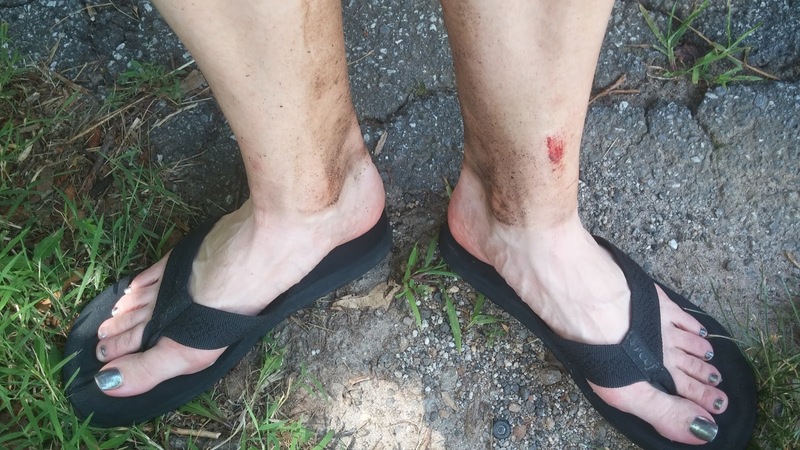 Ultra training requires more miles and the tediousness of the same spot was wearing even on me. Ultra training also requires more practice on uphills, downhills, on dirt, and over rocks and roots. 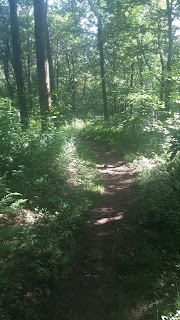 Summer has me seeking the shadiest paths in the closest 5 counties, despite actually rising early to avoid the midday heat. And lastly, I have trail lust while firmly entrenched in Cheryl Strayed's Wild. The verdict is still out on the piece of literature itself, but it's incredibly easy to fantasize about hiking the Pacific Coast Trail (PCT) for months at a time. So I scour Google Maps in my down time. A lot. 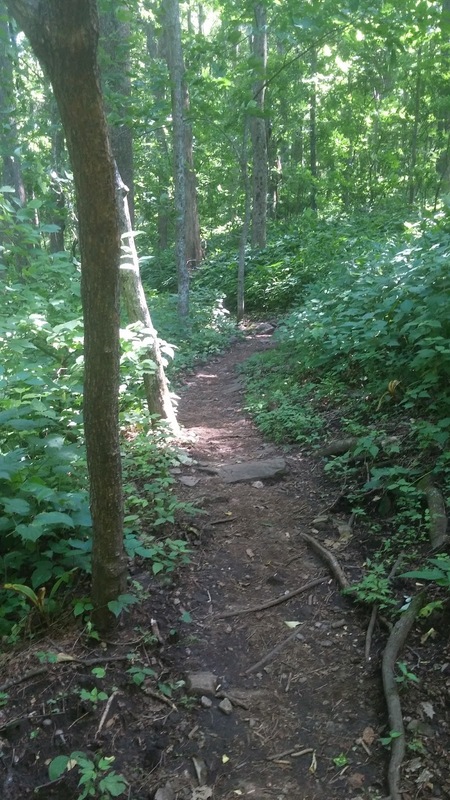 Looking for new and interesting places to get my trail fix. I prefer closer, longer, and beautiful. Obviously. Last week, after feeling delightfully and oddly great after 39.3 miles on Friday, I racked up a few more miles early in the week. 4.1 miles Monday, 7.3 Tuesday, and 7.5 on Wednesday. 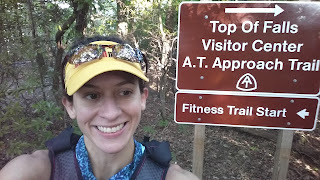 Deciding my body was oddly feeling up to the challenge of a longer run, I found the Appalachian Approach Trail was just about an hour's drive from my house. I packed up my wares early Friday morning and scooted out as the sun was rising. A quick stop for gas and cash, I watched the buildings of suburbia become replaced by the winding forested roads of North Georgia. As I pulled into the Amicalola Falls Park, I realized I had beaten the attendant taking money for parking. Needing change for my $20 to use the "on your honor" pay envelopes, I drove to the top of the falls in hopes that there would be someone at the Inn that could help me. I put on my pack and wandered into the Inn where a hostess happily obliged to change out my $20. I stopped briefly at the visitor's desk to situate my money and looked around for a trail map. A backpacker beginning a 2-week journey was talking to a ranger nearby and the 3 of us started chatting. The ranger provided us trail maps and told us to be on the lookout for bears and copperheads. I instinctively touched my new knife tucked away in my shoulder pocket hoping that Murphy's law meant that I would have no use for it. 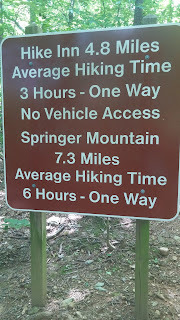 The backpacker (who looked like more-svelte Santa Claus) and I chatted a bit more as I explained I was just going up to Springer Mountain and heading back. He said he'd look for me on the way back as he was going at a much slower pace. I started for my car to put my extra cash away, but then I decided to just stick it in my pack and hit the trail. As I was walking down the stairs just outside of the Inn, I tripped over nothing and tumbled down the stairs. I shake myself like a dog to get the bad voodoo away and carry on. 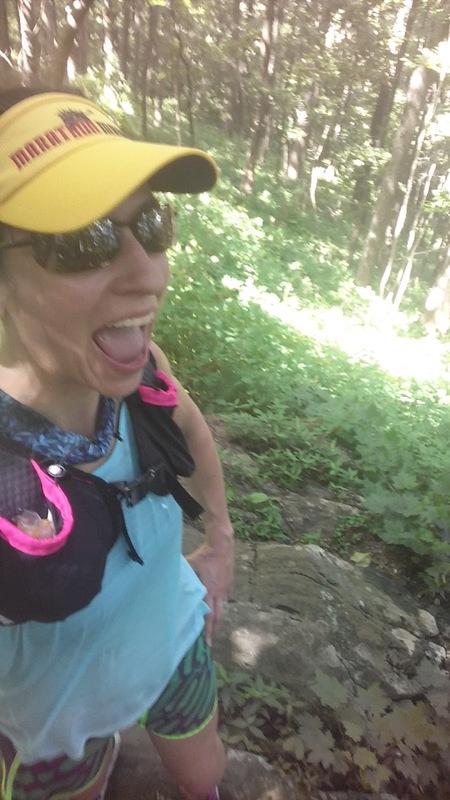 The first section is a nice little downhill on a gravel road and I feel the weight of my pack as I shuffle into trail running mode. Once reaching the crossroads and getting onto the real trail, I decide to just see how the day shakes out. I will walk when I'm tired or it's steep and run when I feel good. I leave my Garmin running unless I am completely stopped. Snacks, selfies, etc. I knew I'd be climbing for a good portion of the first half. 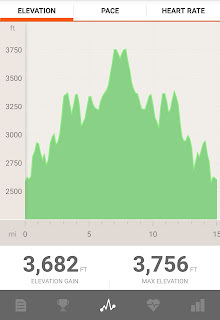 There were some descents and a few flatter sections that made me feel like I was progressing, but I watched the miles tick off in practically twice as much time as my road miles. Which was actually okay. I was enjoying the views, the silence, and the ease of the morning. I had hydrated so well that I made a pit stop just off the trail around mile 3. 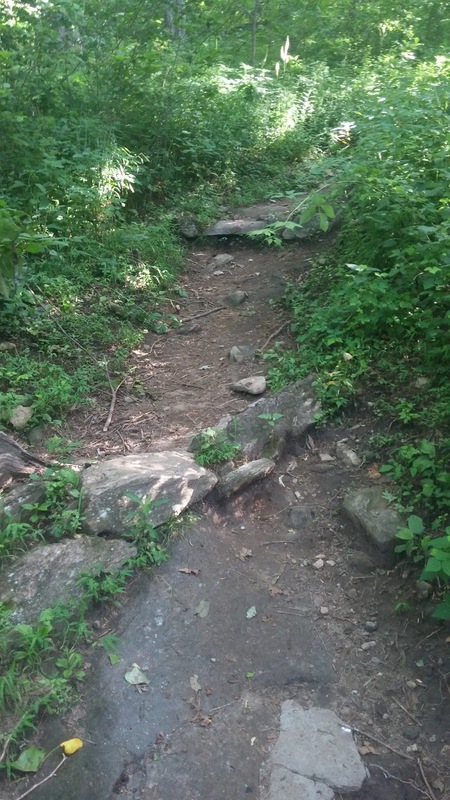 I was very relieved that no one came bounding around the trail during that time. As the day moved on, I saw more and more people out hiking and backpacking. 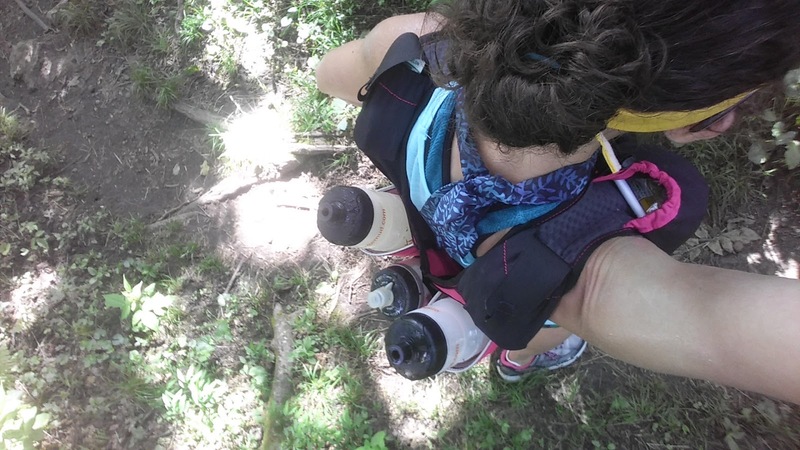 I stuck an extra water bottle in between the bottles on my pack with a bungee cord. But it kept slipping down and I eventually took off my pack to rearrange it. After a few removals, I finally wizened up and turned the stupid bottle upside down. Duuuuh. With the squirt top facing down, the bungee actually had something to grasp. Feeling royally dumb and yet smug at the same time, I bounded down the trail to the final descent before the last big climb. 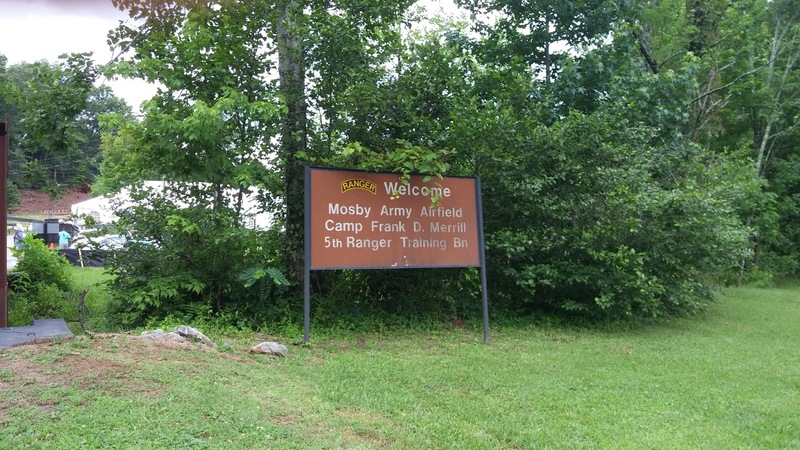 At was at Nimblewill Gap that I noticed my FitBit was no longer on my wrist. 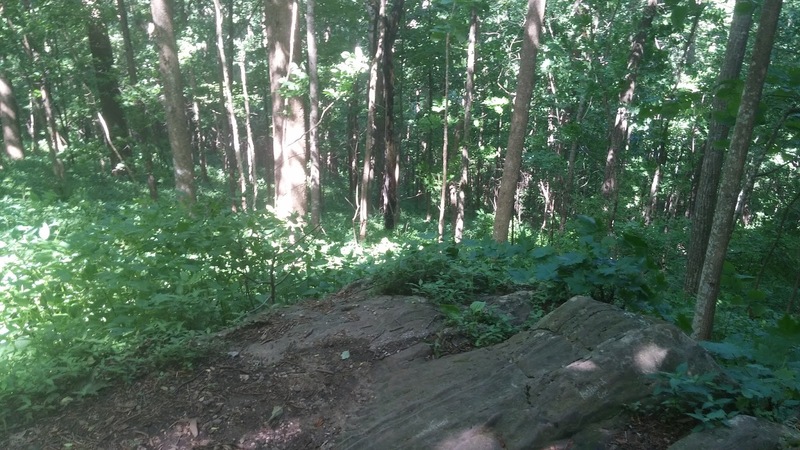 I frantically looked around when I realized it and then it dawned on me that it could be anywhere along the trail in the previous 6 miles I had just covered. Ugggghhh! I knew it wasn't going to do me any good to fret about it and so I carried on, deciding to keep an eye out on my way back. 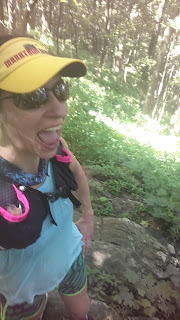 The climb to the top was rocky and full of steep sections, but I was still full of energy and climbed with relative ease. Scrambling over the rocks was actually kind of fun and I held on to nearby trees as I swung myself around the switchbacks. Without any time goals, it really was just playing in the woods. 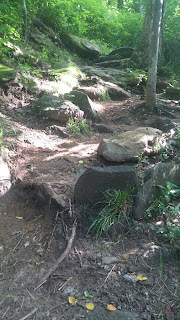 As I approached the top of Springer Mountain, the trail started to spread out a bit and was full of huge rocks. 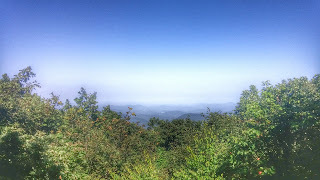 I noticed a few trails that led off to campsites, but the main trail went right up to the lookout and the beginning of the Appalachian Trail. On a cooler day and less hazy day, the visibility would have provided an even more beautiful picture. 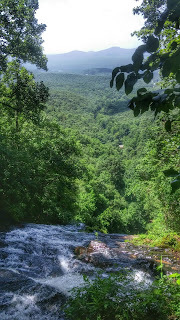 I soaked in the view for a few minutes before running a short towards the shelter area. I was in between 7 and 7.5 miles and decided to start heading back once I got to 7.5 miles. A trio of backpackers headed to North Carolina stopped me at the top once again and asked if I could take their picture. I stood around for a few minutes talking to them about their journey and ate a package of Fig Newtons. Though I didn't really want to make the trek back to reality, I eventually tucked my trash in my pocket and went back the way I came. Going down was almost as tough as going up. Though I wanted to fly, the roots and rocks made getting footing rather difficult and so I just kept at a pace that would prevent me from drawing any more blood. Once I reached the area where I realized my FitBit was gone, I started to look for it when I could. It was hard to key my eyes on the trail looking for both foot placement and searching for a small wristband. I kind of started to give up thinking that it seemed funny to lose a step tracker while on 15 mile run. I probably was going to get my steps in for the day. 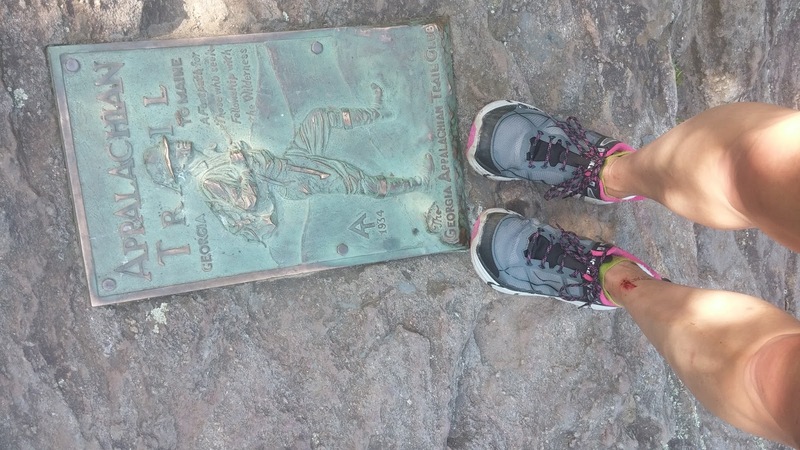 As I got past the 11th mile, I came up to the same backpacker I saw at the Inn that morning. I stopped my Garmin to say hi and ask how his hike was so far. He told me I had made great time and asked if I had lost something earlier. Curious, I told him I had lost my FitBit. He told me he saw me fall on the stairs from the upper part of the parking lot and when he saw me brush myself off, he decided I was okay. 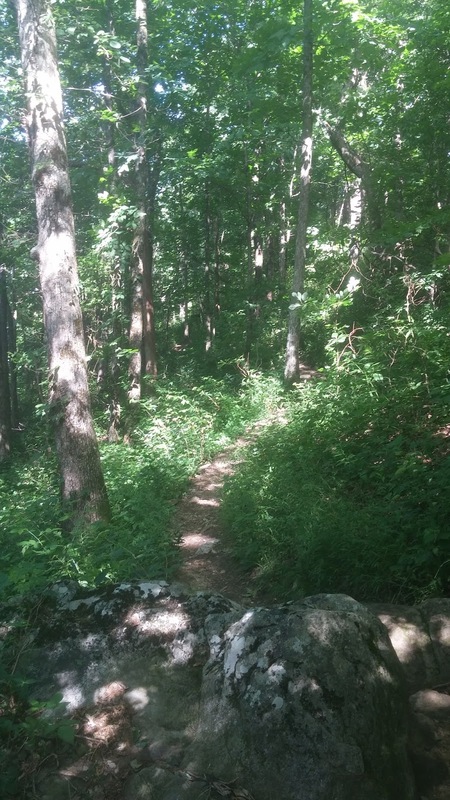 However, when he went by the same section to go out on the trail, he saw where my FitBit had come off and put it in his pocket hoping he'd see me coming back. I was so excited that I smiled for a near half mile after we parted ways with well wishes. Trail magic! It definitely made the next few miles much easier and I patted my wrist over and over to make sure it was still there. 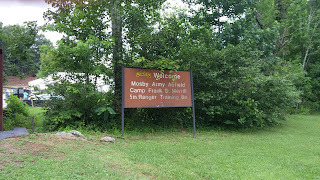 As I neared mile 15 and the start of my journey, I looked around for the sign that I remember seeing on the way out. 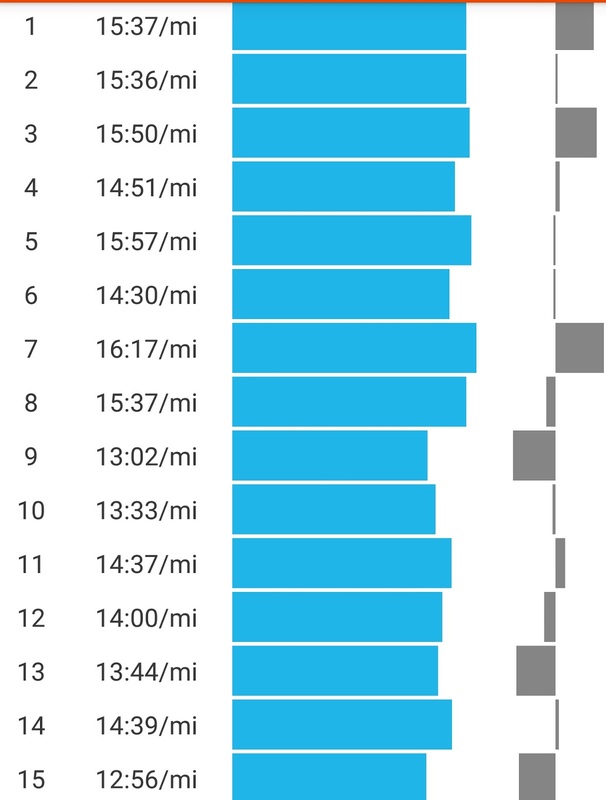 Beating the suggested one-way time by two hours made me feel a little better about my 15 minute miles. 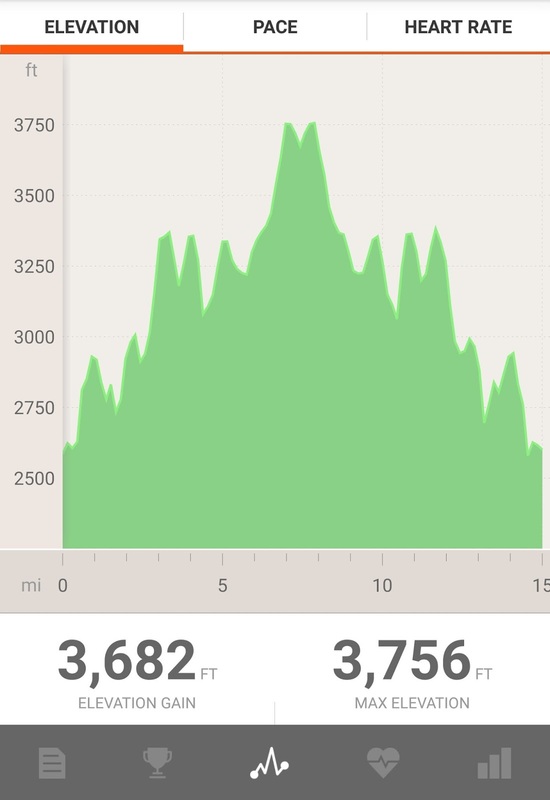 And then when I checked out the elevation profile, I felt even better. 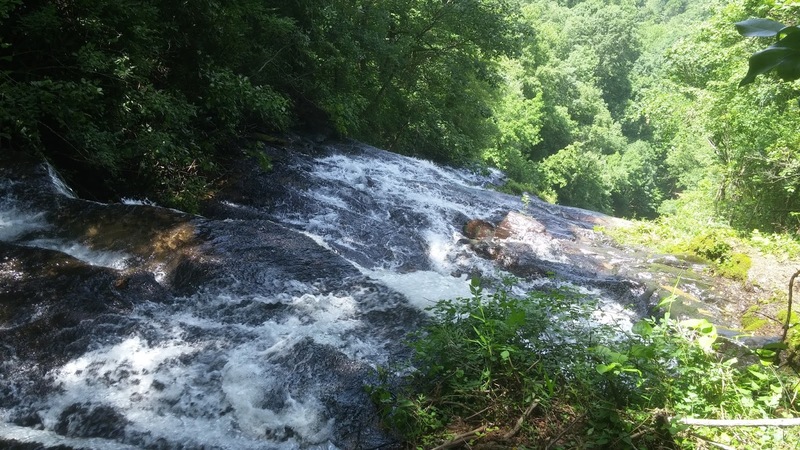 Before I headed back to the car, I decided it would be really dumb of me to drive to Amicalola Falls and not actually look at the waterfall. So I walked to the top of the Falls, half-drunk with happy exhaustion. I was covered in dirt, blood, and probably smelled like I had just run 4 hours in the woods. But the other tourists nearby didn't flinch when I stepped close to the rail to take a few photos. So that's a win. After I got back to my car, I checked out the damage. 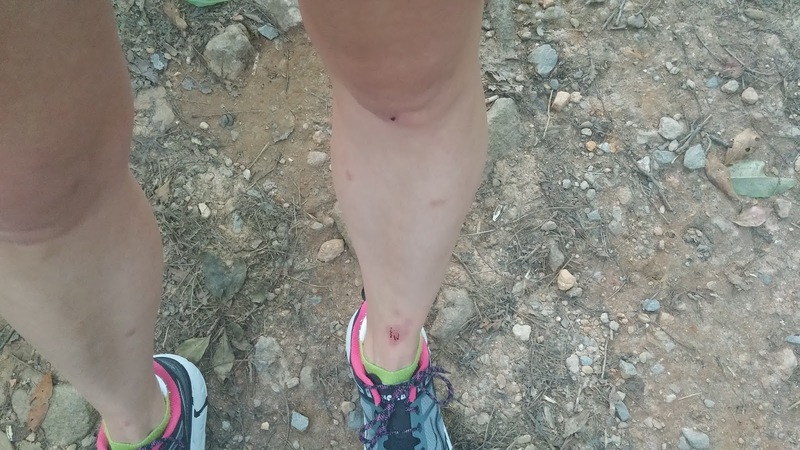 Dirt lines and blood are surely the mark of a memorable trail run. I left them intact as I drove back towards civilization. They would fade eventually like the wanderlust. But that excited feeling of returning to a few uninterrupted amongst the trees will be back. Oh hi. It's me. I once prided myself in keeping up with my blogging on a regular basis, but well, I got busy. 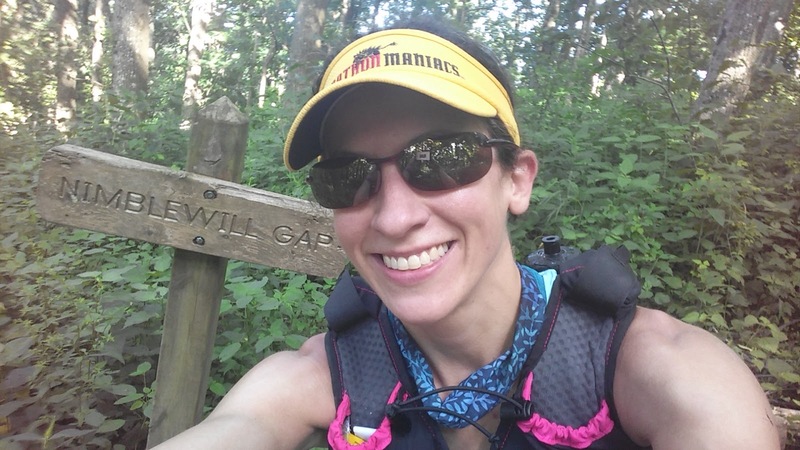 Training (smartly) for an ultra just isn't going to happen on 25 miles a week. And I have to go to that pesky work place 40 hours a week. And I have that little side writing gig. And the summer outside chores eat up an hour and a half once a week. 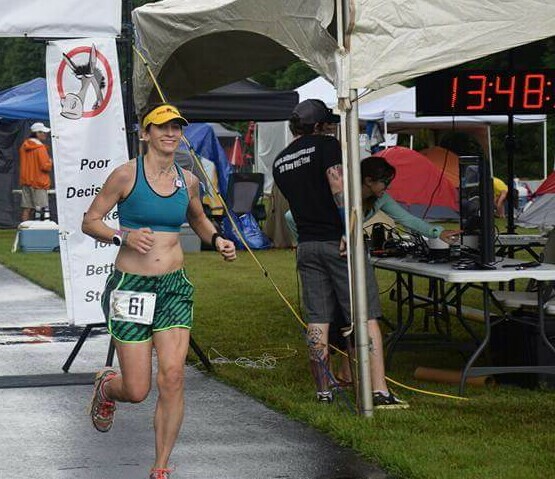 But I feel like I owe it to myself to write this race report. It was a big accomplishment and I'm super happy that I loved my very first foray into the ultra world. It's no secret that I have been contemplating running the Woodstock 50 miler in September. After making it through the double marathon weekend barely 2 weeks after Boston, I started thinking that maybe it was a bit silly for me to start with a 50K. I knew my body was really, really capable of 50K. 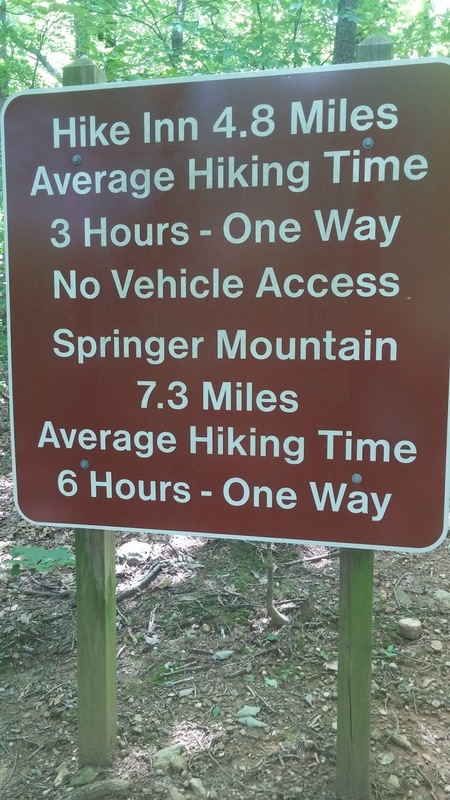 But 50 miles? That was a challenge worthy of accepting. The trouble with beginning training for an ultra in May in the deep South is the lack of longer races available as training tools. There are 5Ks and 10Ks galore, but anything over 13.1 miles is laughable until October. 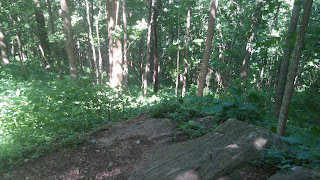 However, I started doing some intense research and tried to figure out a way to get some practice before I found myself in the middle of the woods of Michigan crying. There were a few ultras I found that were a possibility, but completely contingent on getting time off work. I value my requested weekends off and decided to just see how the summer went. Flash forward to the last week of June and a scheduling snafu that led me to have Friday, July 3rd off. I had been creepin' on Merrill's Mile timed races while doing my research and within a few hours, I had convinced myself to dial back the rest of June and go for the 6 hour race. It was taper time! 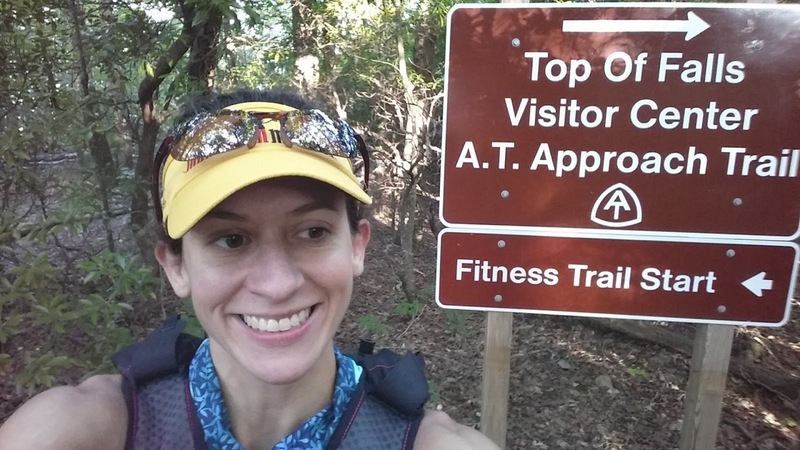 So, like, normal people probably don't decide to tackle their first ultra 10 days before the event. But we've already established I'm not normal. I fret a bit about what to bring/what not to bring. I have momentary butterflies about the insanity. But I'm actually pretty relaxed all things considering. I honestly don't have too much time to fret during race week. I worked the 7 days prior to the race, including the day before. Time on my feet? Check. There was no time to really put my legs up and rest and this did concern me a bit when phantom taper pains decided to play their little tricks (spoiler: all madness and fakery). After a shout out to Loopville for suggestions and conversing with my #1 RB, I ended up with just carry-on luggage. 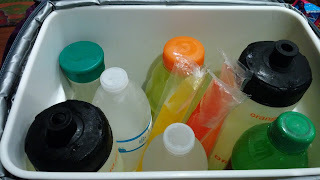 My main concern was staying cool and having plenty of options for calories. 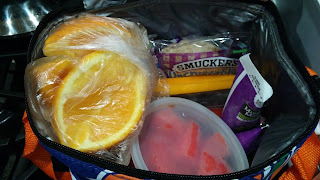 I packed a larger cooler with drinks and popsicles and a smaller cooler with more popsicles, fruit, and Uncrustables. I loaded the sides of the cooler with GU, Starbursts (unwrapped minis), peanut butter pretzels, and cooling handkerchiefs. I ate a boatload of spaghetti the night before. Like 3 healthy servings. Still hungry, I grabbed a Haagan Daaz bar to top of the calories stores. Or something. Whatever, it tasted delicious. 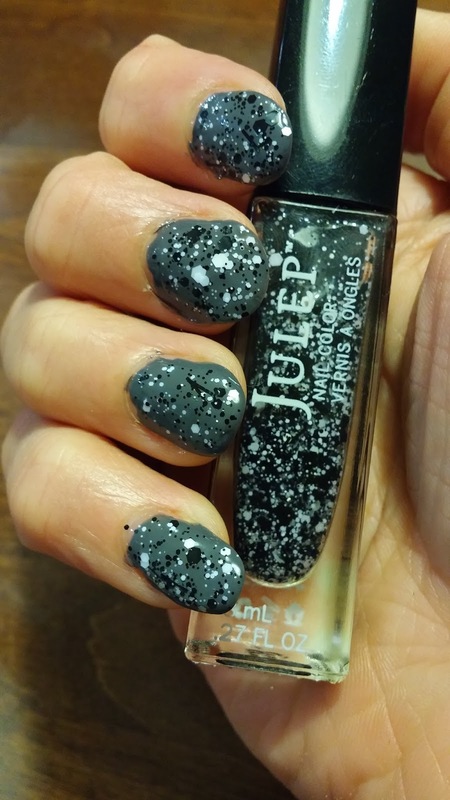 I painted my nails with a prettier-than-pavement theme. 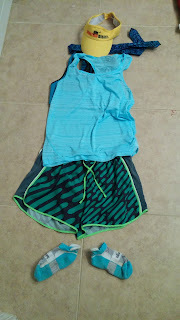 And laid out my flat girl. We had been having pop-up thunderstorms in the late afternoon for multiple days leading up to the race. I just had been checking the temperatures and was honestly relieved that it was only going to be in the 80's and not in the 90's. Small victories. 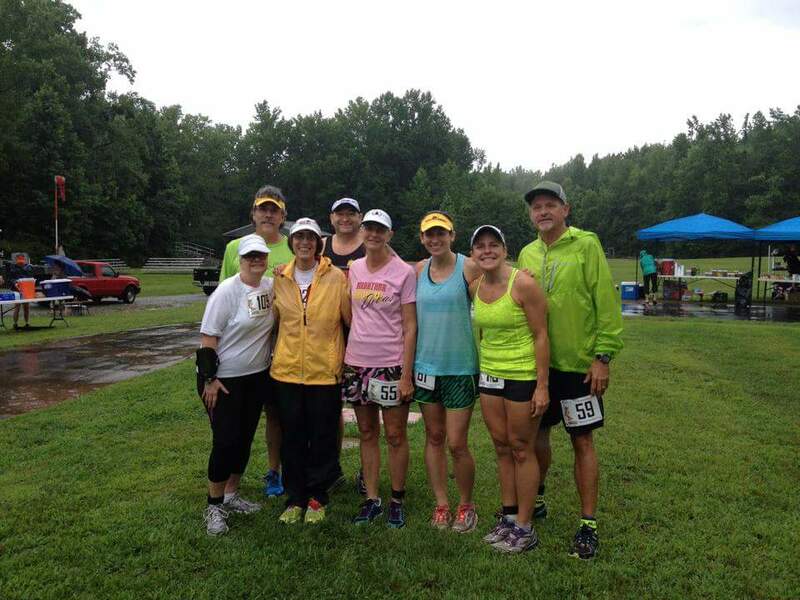 Smart runners also check the precipitation. I woke up and the sky was filled with booming thunder and flashes of lightening. Peeeeeeerfect. At least it's not hot? I eat my bagel with peanut butter, drink a cup of coffee, and load my bags of junk into the car. Driving in the rain is awful and I can barely see the road. I'm warm and dry in the car. And driving over an hour to run 6 hours around a 1 mile loop in a thunderstorm. And oh yeah, I paid for this! But as I get closer to the race site, I start getting really excited. I'm pumped to go beyond 26.2 miles. And I'm thrilled to make an attempt at 50K. 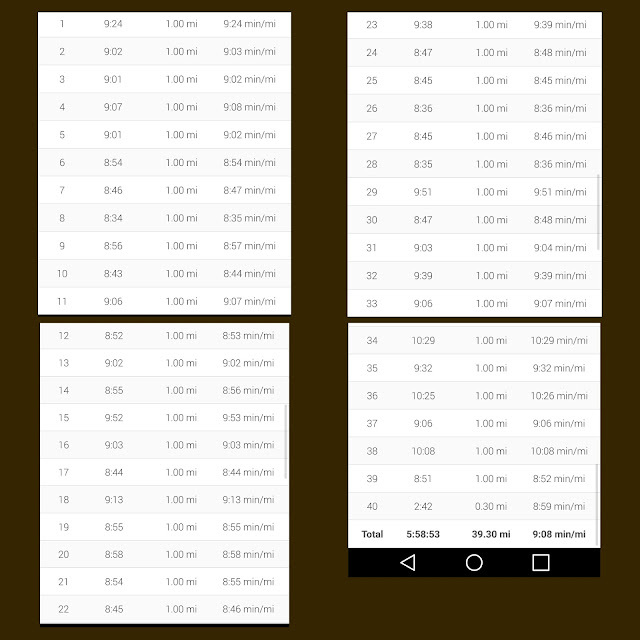 And if I'm feeling great, I might have a chance to get my 36.7 miles to get halfway to 2015 in 2015! As I pull into the camp, I find a bunch of runner cars. You know, with distance stickers plastered all over the back and peppy people spilling out into the parking lot? It's just before 8am and the race starts at 9am. I was going to just hang out in the dry car for a bit, but I'm ready to get the show on the road too. So I bumble around with all my bags feeling like a real amateur because everyone else has their smart rolling coolers and dollies. It's a short walk to the check-in tent and I get my bib, timing wristband, t-shirt, and the offer of a soggy Trail Runner magazine. 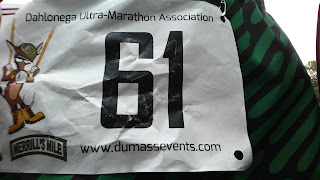 I grabbed a few safety pins, get my wristband scanned, and head off to find a patch of grass to set my meager bags down. Once beyond a few of the tents, I set up a little spot and lose 3 of my 4 safety pins while trying to organize my stuff under an old heat sheet I found in my car. I head to the port-a-potty, stop at my car to make sure I brought everything and grab an umbrella, and go back to the check-in tent to get more safety pins. While I'm standing there, the runner in front of me is asking the check-in person if there is a communal tent to put stuff. The check-in person indicates that there really isn't and I jump in and offer up my MacGyver tent. I coerce the runner to come put her stuff with mine and chat up her and her husband for awhile as we wait. 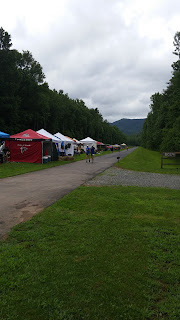 Eventually, we make our way down towards the start area and she asks if we can set up under a tent that they had put up. They agree and we haul our stuff back down. A few other stragglers join us and I'm glad to just have random happy strangers that are talking to me like we know each other. A bunch of us are wearing Maniacs gear and we pose for a picture. After a safety briefing of basically telling us to not stand on the course, stay to the outside if we are slower, and explaining how the course reverses every 6 hours, we line up behind the start line. With very little fanfare, the clock turns to 9:00 and we begin. I am aiming for 10ish minute miles unless I feel super comfortable with something faster. I have no idea what to expect after mile 26.2 and don't want to go too fast. So I decide to just keep an eye on things for the first few miles as I warm up. As we are rounding the turn on the second lap, I hear a runner say and now for the downhill part. I notice that it starts to feel a little easier in the second half of the lap. 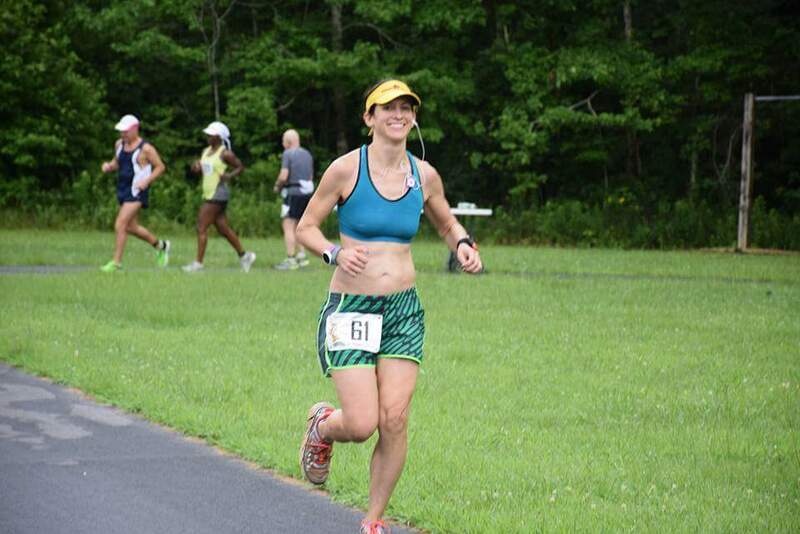 When I come around for the 3rd lap, I (stupidly) realize that there is a small incline in the first half. Oops, totally missed that while doing my research. It's not enough to really make too much of a difference, but it is noticeable when the body is in a tired place. I hadn't really planned any of my nutrition out. I just figured I would at minimum eat something every 45 minutes or so like I do in a marathon and add if necessary. The rain eased the need for massive hydration, so I decided I wouldn't bother carrying a bottle unless the sun came out. By the 4th lap, I decided that I just wanted to zone out with my iPod so I stopped at my bag and to drop my shirt and grab my tunes. The music instantly made me feel better, but I kept one ear bud out in case someone wanted to get chatty. Some people were just walking from the get go. Some used timers for a run/walk strategy. And some were just running. All ages, all capabilities. Lots of people were paired up and just chatting about running. 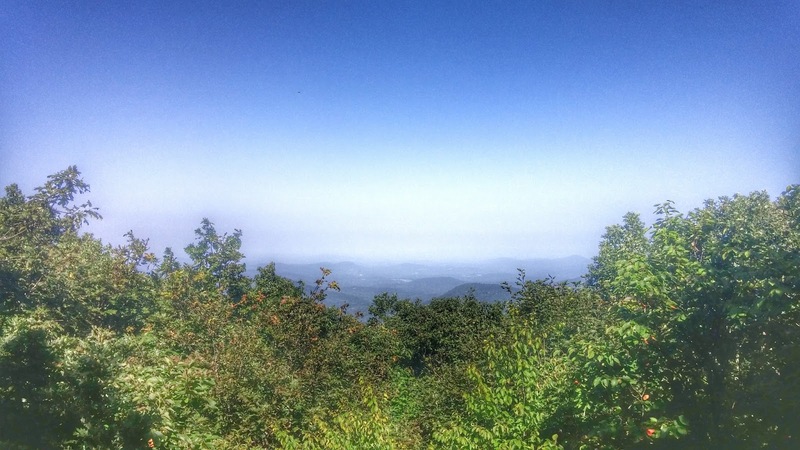 Every time I heard glimpses of conversation, it was always about races and running. The rain let up with the first hour and I found myself dipping below 9's in a very comfortable way. I stopped at some point to use the port-a-potty, but the stop made me feel the need to go fast. I have no idea which mile it was because I made up the time in the lap. They had Tailwind in a cooler at the aid station so I tried to alternate my drinks any time I stopped. I probably consumed about 40% each Tailwind and the grape Nuun I brought, 10% Mountain Dew, and 10% water. I had an espresso GU in the first hour. My stomach felt fine and I just was mindlessly moving around the laps. By the second hour, the runners had completely spread out and I lost track of who might have been ahead of me. The 6-hour Friday day, 12-hour Friday day, 24-hour Friday, and 48-hour racers all begun with my group. There was a lot of passing back and forth between people. In the second hour, I had a root beer GU. 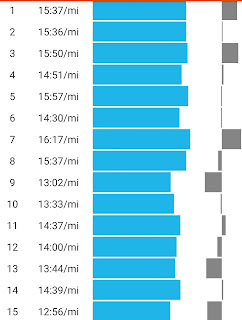 I saw that I would be nearing 13.1 miles near the 2 hour mark which meant that I was in a good place to stay on pace. I enjoyed my brief little stops at the aid stations and started to see the same "spectators" as I was coming around each lap. Some were watching, some were reading, some were talking to each other. It became a little game to kind of watch what each person was doing. In the third hour, I kind of lost track of laps and time. 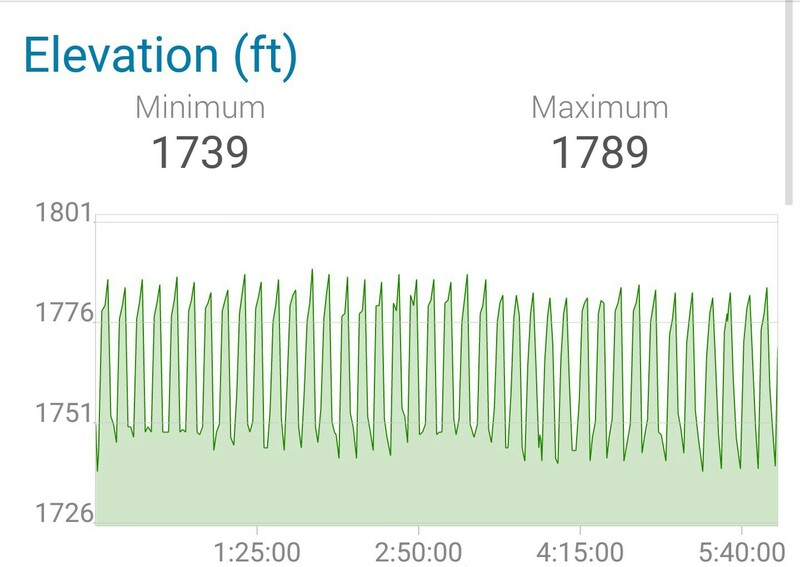 I had to look at my Garmin to see where I was. Lap 16? Oh, 18... whoops... It was actually really nice to just run and run and run and not really pay too much attention. I ate some watermelon at the aid station and let it drip all over me as I crammed it into my mouth over a trash can. It was delicious. Coming into the 4th hour, I was getting excited about crossing the marathon distance and heading out into the great unknown. 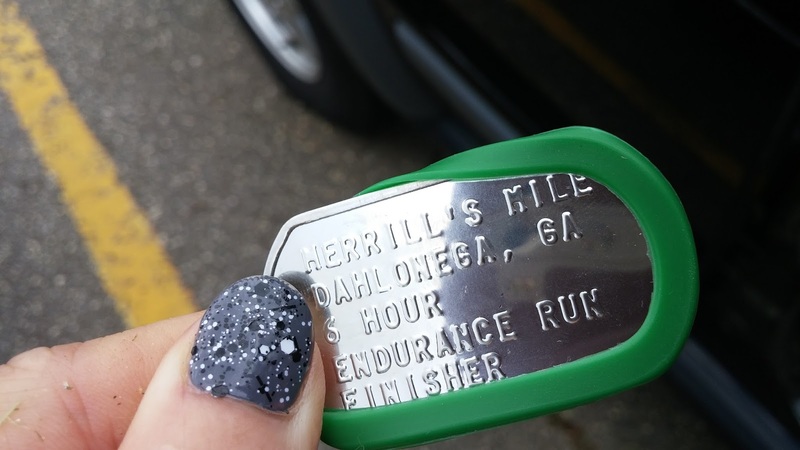 I knew that hitting those next big miles would be inspiration enough to keep me going. 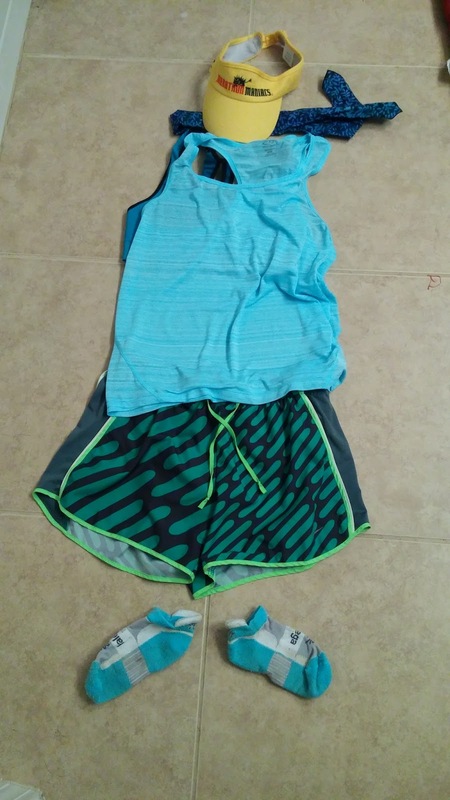 I was happy that I was on track for my 2nd fastest marathon of the year and this was just supposed to be an ultra-experiment-training-run thingy. I grabbed an Uncrustable somewhere in the low 20's and within minutes, I felt so, so good. I am not really sure if it was placebo effect, but it worked. 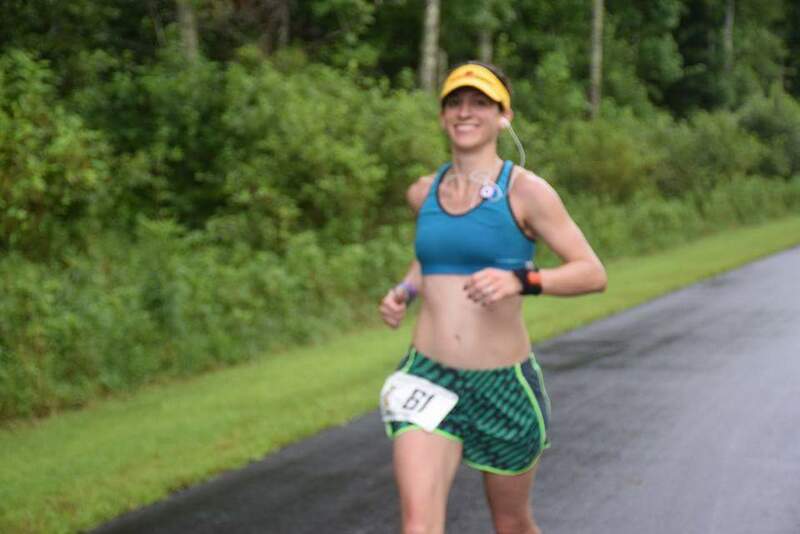 The next few miles were great and as I neared the 26.2 mark, I was felt nervously excited that I was going to still have 2 hours to lay down some miles! 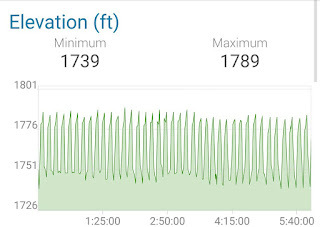 My Garmin had 26.5 listed as my longest distance prior to this when The Flying Pig course ran long last year. Passing that little mark was another hurrah as I headed into new territory. Each mile after that was pure joy. Because I was doing something I had never done before. And with each passing, I realized just how strong and capable I felt. Many of the other racers were in run/walk mode and a teeny part of me felt a bit jerky as I went by with a big goober smile on my face. Like a robot cracked out on Uncrustables. As I inched closer to the 50K mark, I decided to eat my other sandwich. That one made me feel a little jumbled and I decided to just stick to the watermelon and Tailwind after that. It wasn't enough to slow me down much, but I knew I still had over an hour of running left. 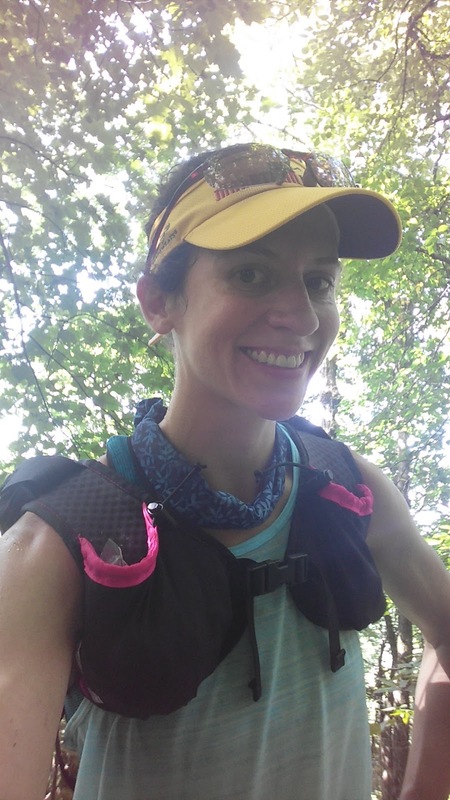 Once I crossed the 50K mark, I started gunning for 35 miles and maybe, 36.7 miles? A guy came around taking pictures around mile 32 and I was pretty ecstatic to be still happily running. I was definitely doing lots of runner math in my head the last hour. 35 seemed doable. 36.7 seemed doable. So I went for it. As I crossed past that magic mark of 36.7, I realized that I was inching near 40. 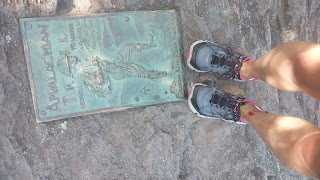 But my legs were definitely starting to tire and I had decided to jump on the run/walk strategy. I would walk for .2 miles and run 1.8. Somewhere near crossing mile 38, I realized that if I made it to 39.3, I would have run a marathon and a half! They only count full laps in the race and a few runners tried to tell me I could stop as I kept going with a few minutes left on the clock. Once I explained I was trying to get to 39.3, they were like, oh okay! As I headed down the track one last time, I couldn't help but break out into a huge smile. These last .3 were for me. Those 39 (!!!) were in the books. 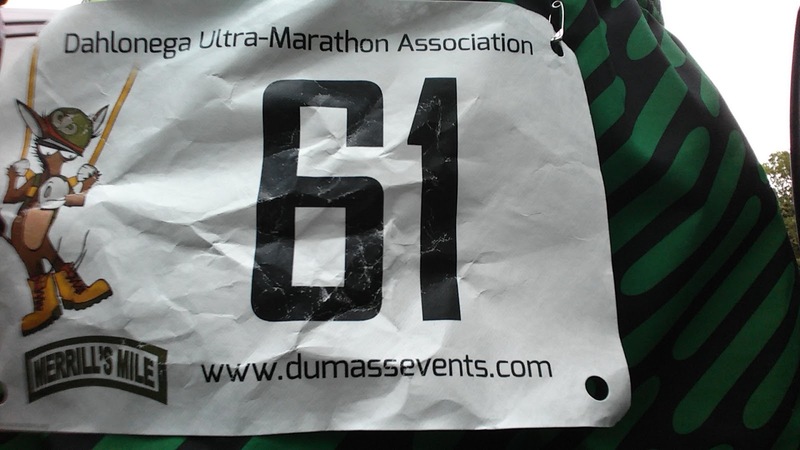 I clicked off my Garmin at 39.3 and peeled off into the grass to walk back to the start. I turned in my wristband and ask to see my results. The young man explained my miles, average pace, blah, blah, blah. I asked him what that #1 was next to my name? He said, oh, you were the first female. Another guy nearby explained that they wouldn't have the official results until after the other 3 6-hour races were ran over the next 2 days. Results are still pending as I write this. But, dudes, no matter what the other times were, I won this race! 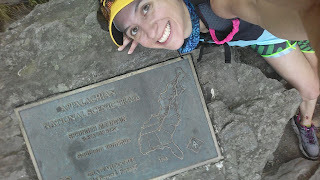 Things that made this amazeballs: Winning, overall mileage, hitting my goals, watermelon, Tailwind, Uncrustables, rain, music, Vaseline, smiling, ultrarunners, flattish course, and Smoky Mountains smoking all morning. Things that might have made it more amazeballs: Loopsters in attendance and a day off work prior to race day (or at least not 7 days straight). Yup. Completely and utterly hooked. When do I get to do it again!?!? !